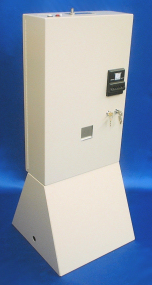 The M6500 CreditVend™ Copier/Printer Controller accepts nickels, dimes, quarters, dollar coins, and $1 and $5 bills to vend one or more images, depending on the amount of monetary value available. One price is available for all image types. The M6500 employs SmartCoin™ technology to ensure that change is always available for every conceivable vending situation. The M6500 is available in an ethernet version (M6500L) for copy and print vending from a release station. Click here for further information. The M6500 is warrantied against manufacturing defects for a period of one year from date of shipment, to be determined by the serial number on its main board's microchip. Warranties for components of the M6500, if different, supercede this general warranty. Specifically, the standard MDB changer is warrantied against manufacturing defects for a period of two years from date of manufacture, to be determined from the first four digits of its serial number (wwyy). Advanced Technologies (Tekvend) does not warranty its product for damage caused by abusive use, vandalism, improper installation, and improper field repair. Installer is expected to use the original copier specific harness (sprig) supplied by Advanced Technologies (Tekvend), and install the M6500 on the originally specified copier, unless otherwise authorized.